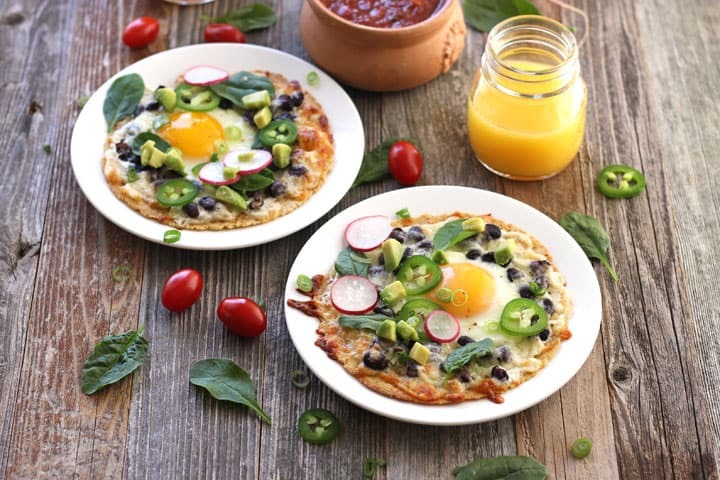 Baked Egg Tostadas are a quick and easy toaster oven breakfast. 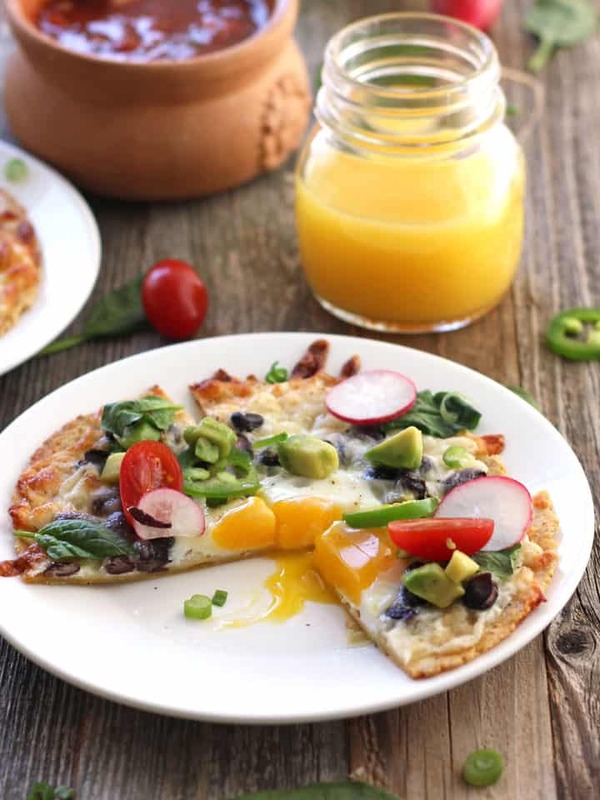 Load them up with your favorite fresh toppings like spinach, tomatoes, and salsa for a filling start to the day! Some mornings you wake up craving a SATISFYING breakfast. A hearty and warm meal that will actually keep you full until lunchtime finally rolls around. But let’s be real, weekday mornings are hectic. There’s rarely enough time to get dressed and fed before work. Let alone make a healthy breakfast. 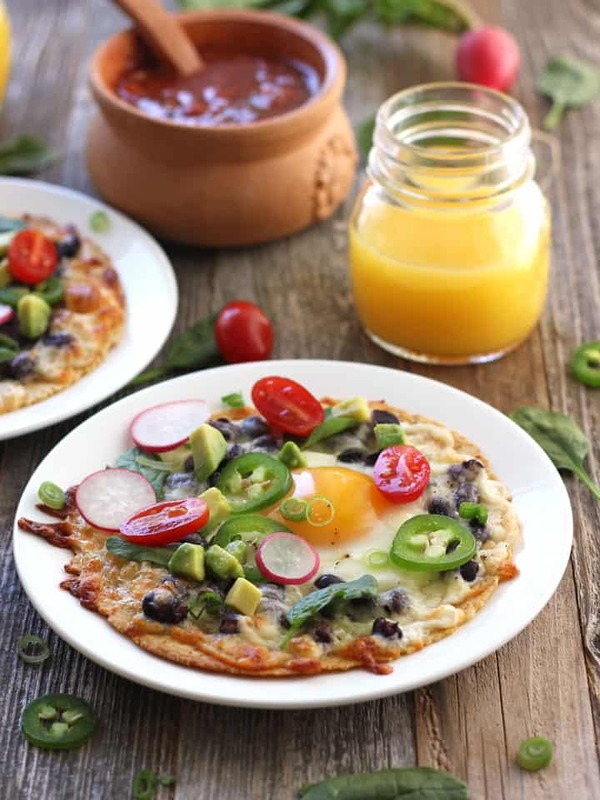 You don’t have to settle for a bowl of cold cereal, friend, this quick and easy Baked Egg Tostadas recipe is here for you (and your hungry belly). 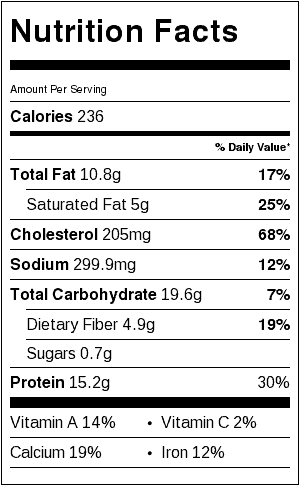 Nutritional Information is an estimate for one bean, cheese, and egg tostada without any toppings added. Tortillas: Regular corn tortillas work great. Recently, we’ve been loving the Corn and Wheat Tortillas from Trader Joe’s. You get the best of a corn and flour tortilla in each yummy bite. The tostada edges are crunchy like tortilla chips while the center is softer and chewy like a quesadilla. Beans and Cheese: These create a “dam” to contain the eggs while they bake. You can use any combo of beans and cheese or use avocado slices to make your dam instead. Eggs: I like to crack each egg into a small ramekin or coffee cup and then slowly pour it into the center of the tortilla. Don’t panic if a little egg escapes onto the cookie sheet. Bake for about 12 minutes to get a runny yolk with the whites cooked through. Bake for 14 to 15 minutes for hard-cooked egg whites and yolks. Toppings: This is a great opportunity to clean out the fridge. Grab that last handful of baby spinach and a few lonely grape tomatoes. If you’re so lucky to find yourself with leftover Jalapeño Roasted Cauliflower, Roasted Sweet Potato Rounds, or Toaster Oven Roasted Broccoli throw those on for sure! I have some super exciting news to share…I’m going to be contributing to the awesome Food Fanatic website! It’s home to fantastic recipes from the most creative food writers and recipe creators online. To say I’m humbled by the opportunity to be included in this group is a serious understatement but I can’t think of another word. What’s so cool about Food Fanatic is how each blogger shares unique recipes in an area they are the most passionate/excited/fanatical about. I’ll be contributing recipes for toaster oven cooking, starting with this tasty Baked Egg Tostadas recipe! You should definitely hop over to Food Fanatic to check out the other Fanatics and their delicious recipes. I also tend to get those needs for big breakfast on busy weekday mornings when I’m slammed with deadlines and don’t have time to cook a feast. These are the perfect solution and I love the flavors! Bet I could make a whole sheet pan full for my family too 🙂 And a BIG congrats on being a Food Fanatic contributor – that’s so great! We had the tostadas for dinner with kidney beans instead of black ones, I knew I wouldn’t find any. And I forgot the oil. Absolutely delicious! My husband said I could make them again anytime. They look amazing, I could actually eat them for lunch today. See if I can get canned black beans, they’re not so easy to come by around here (cooking my own would take too loooong). Wow I totally take for granted our easy access to canned black beans! Yeah, homemade does take too long 🙂 every once and awhile I will spend the day making a big pot with sauteed onions, garlic and jalapeños. I bet you have some amazing bean recipes Adina! Yay thanks so much Grace! Full disclosure: I do usually load these guys up with so many toppings you can’t see the eggs, or beans and sometimes not even the cheese 🙂 they aren’t very pretty then but they do taste yummy. where to begin with these?!? i love each and every ingredient, they’re plated BEAUTIFULLY, and it’s not a difficult thing to make, for any meal! i love this whole idea!